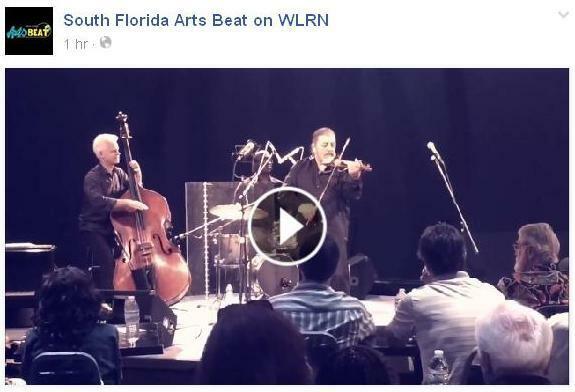 05/15/15 - Next time on South Florida Arts Beat, you can enjoy another exciting studio performance. One of the greatest names on violin in European Jazz comes to Florida to continue his stateside career. Catch the magnificent talents of Vitali Imereli as he performs with his superb trio. A protégé of the legendary Jazz violinist, Stephane Grappelli, Mr. Imereli is poised to become an international Jazz star. Catch Vitali Imereli live on the next South Florida Arts Beat Friday at 1:00pm. 05/08/15 - Next time on South Florida Arts Beat, Christopher Cook, Executive Director and Gean Moreno, Artistic Director of the non-profit Cannonball are dedicated to supporting artists. We’ll find out about their latest programs. Contributor Judith Bishop speaks with Julia Andrews, Executive Director of the Coral Springs Museum of Art about exciting upcoming exhibitions and events. 05/01/01 - Next time on South Florida Arts Beat, President and CEO of Creative City Collaborative, Alyona Ushe, guiding light of ArtsGarage in Delray Beach and Pompano Beach’s Bailey Contemporary Arts informs us about exciting events coming to those venues. 04/24/15 - Next time on South Florida Arts Beat, founder and producer Arturo Campa joins us to talk about another exciting Miami International Jazz Fest. Judith Bishop speaks with Leann Standish of the Perez Art Museum Miami about enticing current and future exhibitions. 04/17/15 - Next time on South Florida Arts Beat, Sweat Records’ owner and Indie promoter extraordinaire, Lauren Reskin, celebrates the store’s 10th anniversary, their Sweatstock Festival and Record Store Day 2015. Charles Greenfield checks in with The Florida Grand Opera and their spokesman, Justin Moss. 4/10/15 - On South Florida Arts Beat catch South Florida’s beloved Jazz Pop chanteuse, Ms. Nicole Henry, singing songs from the Great American Songbook to the Pop and R & B standards we grew up listening to and loving.